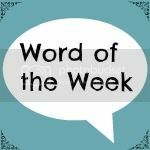 My Word of the Week this week is BOSS! An odd word to choose you may think, but no, because this week I was the boss at home! Last week my Mum made her merry way to the UK for a jolly holiday with her best friends, leaving Step-Dad and I home alone. I stepped into her shoes as head cook and general boss and rather enjoyed myself! I enjoyed being able to cook every night, even though mostly it wasn’t anything exciting! Step-Dad did make his traditional stir fry one night too. I also enjoyed just feeling a bit freer to do my own thing. I was in charge of washing too of course, and all went smoothly in that department too; no red undies in the whites wash! Hoorah! It can be difficult; two adult women living in the same house. My Mum & I both have our own ways of doing things and we both think our way is the right/best way, so the break has done us good I think. She certainly enjoyed her time with her besties, and I enjoyed being in charge, everyone’s a winner! I’ve been given a taste of freedom and I’ve got a taste for being the boss now! Ohh! It sounds like you had a great time and your mum too!